So, what is the new cool? 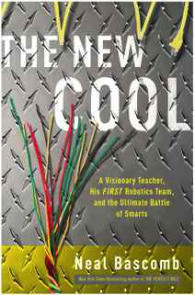 After reading The New Cool by: Neal Bascomb I became even more excited about the fact that I was a TECH teacher and that I had the power to motivate my students and get them excited about STEM. Below are some of my favorite quotes from the book. I hope you get inspired as well! "Dean Kamen decided he needed to create something that made kids want to excel in thinking, something that truly showed how thrilling science and technology could be. He needed to invent a sport that was about smarts, that had its own set of heroes, its own hall of fame, its own supporters and coaches, its own Olympics. Frustrated, incensed, and excited all at once, Dean formed FIRST (For Inspiration and Recognition of Science and Technology) the same day." "Overall, American students were failing to pursue the fields of science, technology, engineering, and math (STEM) in great enough numbers, and the statistics were even more abysmal for women and minorities." "If the United States did not do everything in its power to promote STEM careers, then the country would fall far behind its competitors around the globe, threatening both its prosperity and security. The country had known this when the government invested in science and technology after the Russian launch of Sputnik satellite in 1957, but Dean felt America had lost its way since." "Dean wanted America to flourish, but he was focused on the bigger pictures as well, evidenced by his activities at DEKA. He wanted more engineers and scientists so that a greater army would be battling the challenges tha the whole world faced. Only when these were solved would he feel like he could rest easy and enjoy those vacations he never took." "Why do we do FIRST? Because the world's a mess. Read the news. Look around you. We got lights, clean water, ways to get around. We have hospitals, schools, safe malls. But two-thirds of all people alive today, 4 billion people, live on less than $2 a day. Half of them live on $1 a day. That's their whole life. We're the richest in the world, by far. And the world's a mess. Somebody's got to fix it. Do you think the people living on a buck a day, who don't have clean water, schools, technology, education, do you think those people can fix it? No. You have to fix it." "I started FIRST because so many kids in this country were ignoring that opportunity. Our culture has convinced so many that knowing about Britney Spears or Paris Hilton is more important than real knowledge. We've got to find a way to convince all kids that we have to start celebrating the stuff that matters. We not only have the opportunity, I think we have the obligation--the moral obligation--to help the rest of the world." "So why do we do FIRST? I think it's easy, because the world needs a lot more technology quickly. You've got to be better at it than we were, you've got to learn faster, and you've got to deliver at an earlier age. If you want exciting careers, you better start remembering what used to be true: We have to create wealth. For a while there, the bankers were doing a prretty good job of moving it around. We've got to start creating it again. People who create solutions for problems with the tools of physics and engineering are the people that we will count on. To rebuild our economy. To rebuild the world to make it better than it was. Why do we do it? I think it's pretty easy." "The robot is just a vehicle, just a tool. The skill sets you walk away with will give you careers for a lifetime. FIRST is a genuline card-carrying microcosm of the real world of engineering. We give you a little bit of material, never what you'd really want. You never know what the competitors are doing. FIRST really is a way to show you what the world of science, technology, inventing, and problem solving is. It's all hard, and if this frustrates you, tough, it's important."